← Calling All Milwaukee Makers! Lawrence Alma-Tadema (English, b. Dutch, 1836–1912), A Roman Amateur, 1870. Oil on wood panel, 29 x 39 1/2 in. Milwaukee Art Museum, Layton Art Collection, Gift of the following Layton Art Gallery Trustees, plus Layton funds, between 1892-96: George Dickens, Frederick Layton, William Plankinton, B.K. Miller, Samuel Marshall, J.H. Van Dyke, L149. Photo by John Neinhuis. On December 14, 1894, Frederick Layton, the Milwaukee meat packer and philanthropist who founded the Layton Art Gallery (the predecessor of the Milwaukee Art Museum), wrote a letter to Julius Gugler of the Milwaukee Art Association. Layton requested the organization to raise $10,000 by subscription to purchase a painting by Lawrence Alma-Tadema which was currently on display at Milwaukee’s Pfister Hotel as a loan from one of Layton’s art dealer friends. The subscription must have been successful, because the Layton Art Collection at the Milwaukee Art Museum has a wonderful painting by Alma-Tadema! This painting, called A Roman Amateur, can be found in Gallery #10 with other works of 19th-century European art. Dutch by birth, Lawrence Alma-Tadema (1836-1912) studied art in Antwerp. His interest in ancient subject matter only increased after he traveled to Italy in 1863 and saw the recent excavations of Pompeii by Giuseppe Fiorelli. The next year, he was introduced to Jean-Léon Gérôme (French, 1824-1904). (The Milwaukee Art Museum has a Gérôme painting The Two Majesties also on view in Gallery #10) A prominent artist of the Néo-Grec school, Gérôme used classically-inspired details and narratives in his work. While in Paris, Alma-Tadema saw Gérôme’s Greek Interior, The Women’s Apartments, and afterwards he turned almost exclusively to the ancient past as his subject matter. Alma-Tadema found great success after moving to London in 1870, solidifying his status as a painter with works such as Pheidias and the Frieze of the Parthenon and The Pyrrhic Dance. Paintings by Alma-Tadema are a study in details. Although he takes some liberty with historical accuracy, he recreates the atmosphere of long-gone cultures in a beautiful and fascinating way. The English and American patrons who bought his work saw themselves as a continuation of these great civilizations. 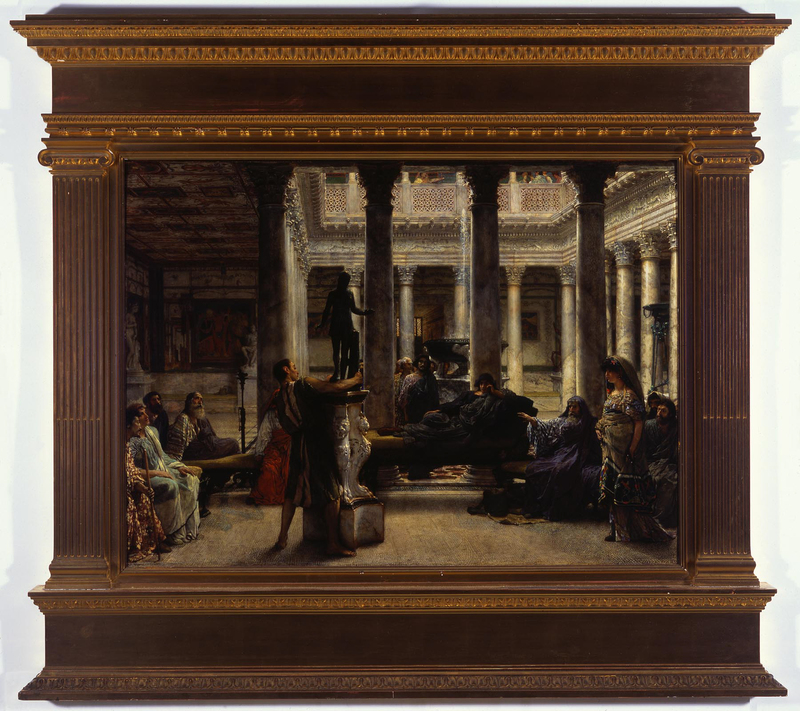 Milwaukee’s A Roman Amateur is one of a series of paintings that depicts a Roman patrician showing off his newest art acquisition in the dramatic atrium of his richly appointed home—not unlike the businessmen who bought Alma-Tadema paintings! Lawrence Alma-Tadema (English, b. Dutch, 1836–1912), A Roman Amateur (also known as A Roman Art Lover), 1870. Oil on wood panel, 29 x 39 1/2 in. Milwaukee Art Museum, Layton Art Collection, Gift of the following Layton Art Gallery Trustees, plus Layton funds, between 1892-96: George Dickens, Frederick Layton, William Plankinton, B.K. Miller, Samuel Marshall, J.H. Van Dyke, L149. Photo by John R. Glembin. Lawrence Alma-Tadema (English, b. Dutch, 1836–1912), A Roman Amateur, 1870. Detail. Oil on wood panel, 29 x 39 1/2 in. Milwaukee Art Museum, Layton Art Collection, Gift of the following Layton Art Gallery Trustees, plus Layton funds, between 1892-96: George Dickens, Frederick Layton, William Plankinton, B.K. Miller, Samuel Marshall, J.H. Van Dyke, L149. Photo by John Neinhuis. The sculpture on the far left is the Medici Venus in the Uffizi Gallery in Florence. The arm and leg of the younger centaur in the Capitoline Museum in Rome sticks out from behind the column on on the right. One of the artist’s strengths was his ability to paint marble, which emanates a glow while looking cool to the touch. Even the individual stones in the mosaic floor are given their due consideration and are painted with a careful hand. Also, you can see that what Alma-Tadema saw on his visit to Pompeii influenced the appearance of the setting: here is a Pompeiian atrium and an example of a wall fresco. It can be fun to find the props that he used in more than one painting. In many ways, his paintings are stage sets (and he did stage design later in his career). He had the couches specially made—one side had legs in Roman style and the other had Egyptian, so that he could change the setting by flipping them around! Alma-Tadema also designed his own frames, and the Milwaukee Art Museum is lucky to have the original one the artist made for A Roman Amateur. As you can see in the image of the painting with frame above, the frame is almost like a small temple. It was inspired by classical architecture and gilded to give it a rich sheen, it is a fitting companion to the painting. After being one of the most sought-after artists of the 19th century, by 1935 Alma-Tadema was almost completely unknown. Changes in artistic taste are usually blamed, and Alma-Tadema is certainly a little hard to swallow for people who disdained the Victorian era. But now his reputations has come full-circle: The Finding of Moses sold for a record $35.9 million at auction in November 2010, which was more than seven times the high estimate of $5 million. You can read an interesting article on the history of the painting here at ARTnews. 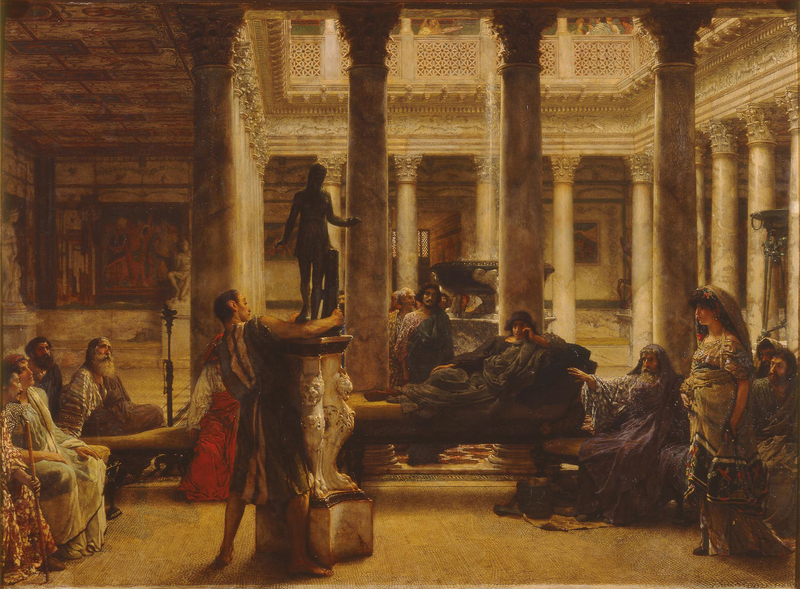 Another Alma-Tadema masterpiece, The Meeting of Antony and Cleopatra, sold in May 2011 for $29.2 million, almost six times the high pre-sale estimate of $5 million. So, visit the Milwaukee Art Museum’s wonderful painting that is a peek into the art tastes of the Victorians–and the ancient world–and thank Mr. Layton for keeping this treasure in Milwaukee! 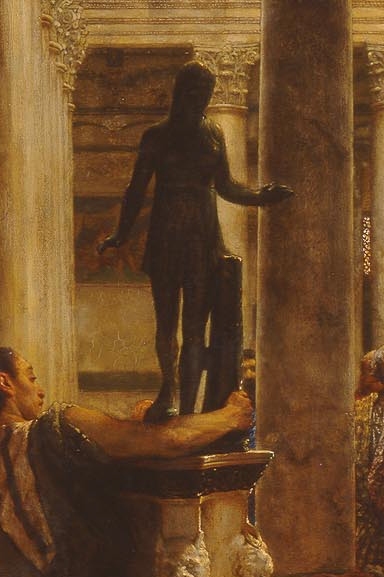 This entry was posted in Art, Curatorial and tagged 19th Century Art, 19th century Milwaukee, Ancient Art, art, European art, From the Collection, Jean-Leon Gerome, Lawrence Alma-Tadema. Bookmark the permalink.